JEGS 52201 - Remote Oil Breather Tank 13" H x 3" Dia. -12AN, 21 oz. 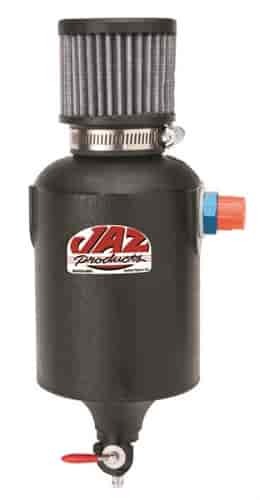 JAZ Products' 1-Quart Breather Tanks are the perfect addition to any street or race car. Available in black or natural color finish, these breather tanks can incorporate into any engine bay. Featured are molded-in 1/4"-20 threaded mounting inserts, lever handle pertcock for easy draining and breather filter mounted on top. Four sizes of inlet fittings are available. I do not see the overall denominations of this unit??? It is 12&quot; from drain to top of the filter.